Seneco Energy Certification are a specialist and independent provider of Energy Performance Certificates (EPC) in Southport and the surrounding Merseyside and Lancashire areas. We are dedicated to delivering accurate reports with a fast, reliable and competitive service, supporting you to meet the requirements of current legislation. 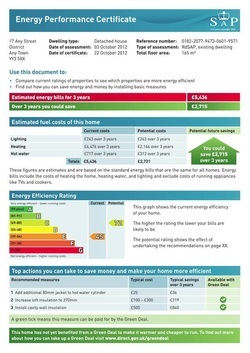 The Energy Performance of Buildings Regulations 2007 require an Energy Performance Certificate (E.P.C.) for all buildings being constructed and also those that are for sale or for rent. The certificate should be made available to prospective buyers and tenants within 7 days from when marketing commences. It is the responsibility of the seller, the landlord and those acting on their behalf to obtain the EPC. You can be assured peace of mind knowing your instructions are being carried out by experienced and professional Energy Assessors who are qualified, accredited, fully insured and monitored for quality through the NHER "National Homes Energy Rating" Accreditation Scheme. All our reports are certified and lodged on the National database. This can be accessed from here. We are more than happy to answer any questions you may have about Energy Performance Certificates.